This listing is for the PATTERN to make these hats yourself, not the actual hats. Thanks. Is there a young girl or tween on your gift list? Chances are she has an American Girl Doll! 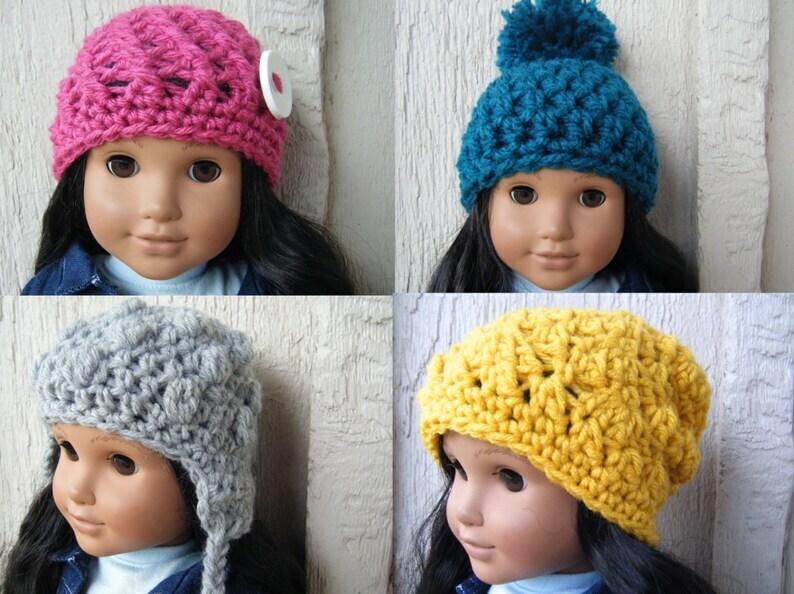 These doll hats are fun and stylish and great in any colors. This crochet pattern yields all 4 designs shown: Textured Button Beanie, Chunky Pom Hat, Bobble Earflap Beanie, and Lacy Slouch Hat. They are modified versions of my full-size hat designs. The hats will fit American Girl Dolls. The patterns use worsted weight yarn, except for the chunky beanie, which uses chunky yarn.